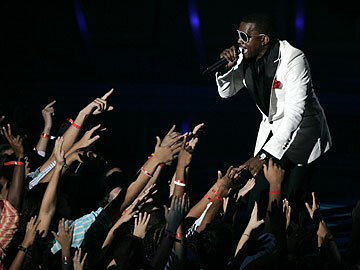 Tickets for the April 9 Kanye West concert go on sale 9 a.m. Saturday. The hottest hip-hop artist in the land, Kanye West, will perform April 9 at the Blaisdell Arena, promoter Tom Moffatt announced yesterday. The Sunday concert comes right on the heels of the U2 show at Aloha Stadium on April 8. Also announced yesterday is an appearance by crooner Michael Bolton, April 6 on the arena stage. The work of West, the Chicago-born rapper-producer, has been both critically acclaimed and commercially successful. His solo albums "The College Dropout" (featuring the hit tracks "Through the Wire" and "Jesus Walks") and the Grammy-winning "Late Registration" ("Diamonds from Sierra Leone" and "Gold Digger"), plus his production work with such stars as Jay-Z, Mariah Carey, Mos Def, Common and John Legend, have made him a force to be reckoned with. He won three Grammy Awards this year, for Best Rap Solo Performance for "Gold Digger," Best Rap Album and Best Rap Song for "Diamonds." West has not been one to shy away from speaking his mind, either. He accused President Bush of not caring about the black people who suffered in Hurricane Katrina, and was depicted as Jesus with a crown of thorns on a recent cover of Rolling Stone. General admission and reserved tickets will be $49.50 and go on sale at 9 a.m. Saturday at the Blaisdell box office and Ticketmaster outlets, including Times Super Markets. Charge by phone at 877-750-4400 or online at ticketmaster.com. Bolton has been a staple of the national pop scene since 1985, known for his soulful voice. He has also been a tireless advocate for victims of sexual and domestic abuse, establishing his own foundation for the cause in '93. Reserved tickets for his concert are $45 and $55, and go on sale Friday at the same locations.